I am here with another layout for Let's Get Sketchy! (Under the wire here!) ;) This layout is inspired by their Week 4 Sketch. My son is a Storm Trooper this year for Halloween. 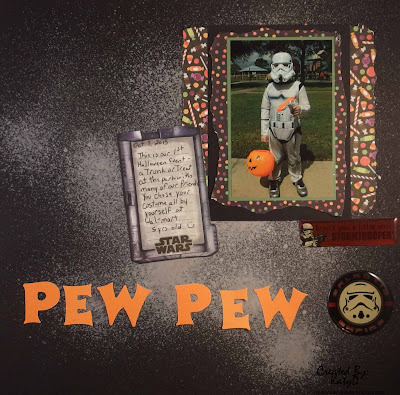 So I love the Halloween Star Wars Mash Up :) This was regular black card stoc that I sprayed White Dylusions spray on. It need something in the background. Super cute page. Thanks for playing at LGS.